Imagine yourself sitting under one of Cirque du Soleil’s big top, waiting for the magic to come alive. Acrobats flying across the stage, objects moving and disappearing into the grid, displays appearing from floor openings and the stage itself rotating to present different views of the show to the spectators. To make all this magic possible, we developed state of the art staging automation control systems. Our touring equipment is designed for rugged environments. 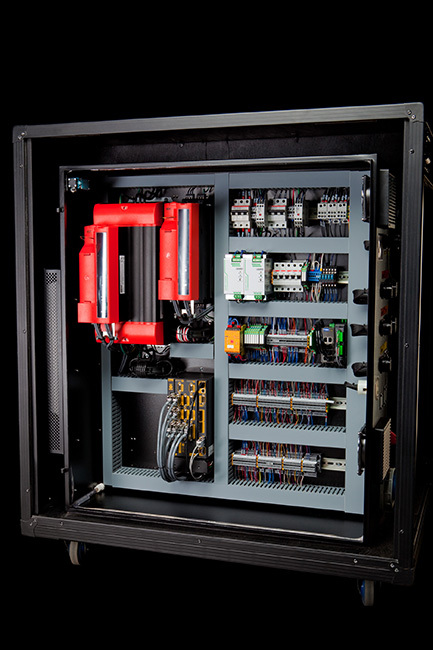 From Motor Controls to Operator Desk, everything fits in standard size road cases and uses industry standard rugged connectors. 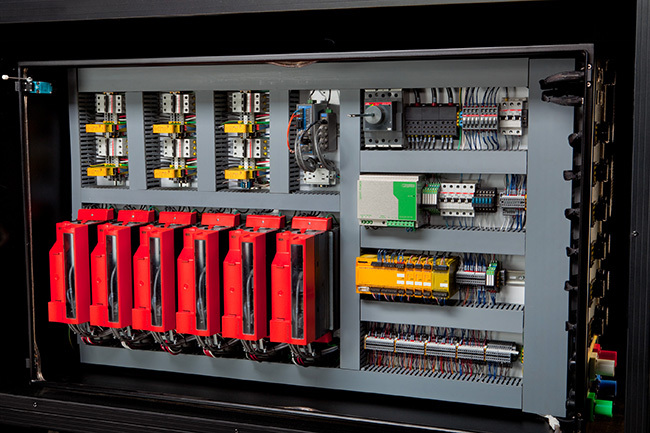 We also use off-the-shelf widely available hardware into the construction of our show control computers, drives, safety PLCs and motors. 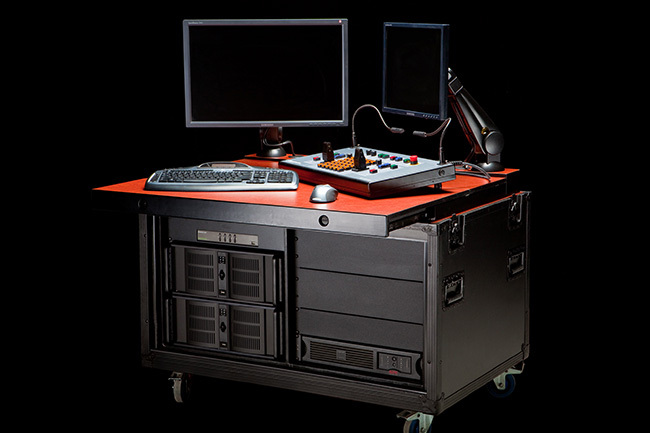 The show control desk consists of a road case that transforms into a usable operator desk in a few minutes. Typically, the desk has 2 computers for backup, a UPS for power failures and an Ethernet switch for drive communication. Depending on the configuration, the central Estop unit can be installed in the desk. The user interface is designed for ease of use. Cues sheets are grid based for easy data manipulation. Extensive cut and paste features are also provided for fast and efficient show editing. 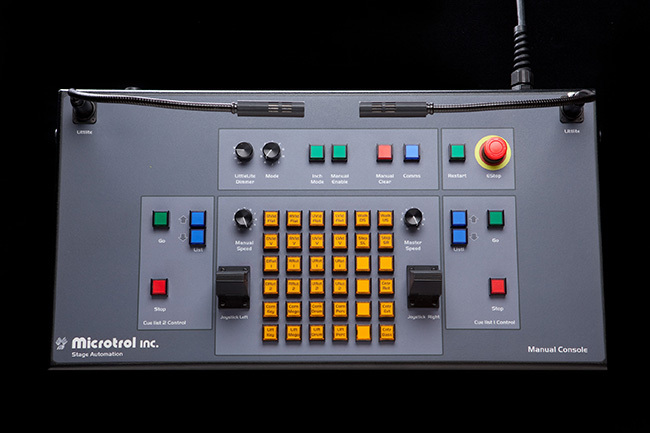 We provide a manual control board where the operator can select one or more axes and move them with joysticks instead of using the keyboard or the mouse. Maximum manual and cue speed override controls are also provided. Integrated lighting situations when required. 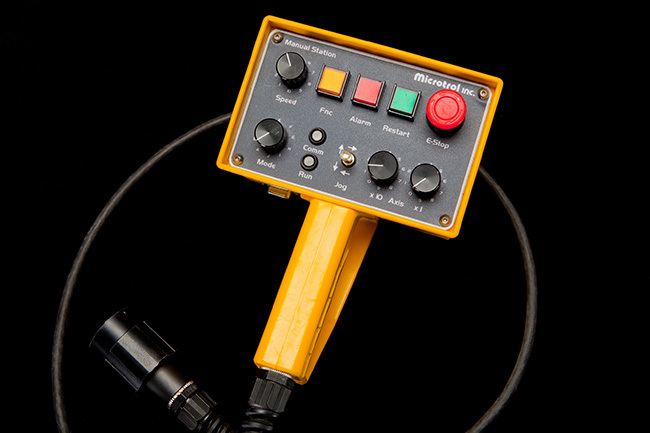 For maintenance and setup, we also provide handheld multi-axis pendants. Using widely available components such as SEW drives, Jokab and Pilz safety PLCs, we package the motion control and drives in standard size road case enclosures that are roadworthy and can easily fit under typical stages. Depending on motor power, we supply drive cabinets that have from 4 to 12 axes. 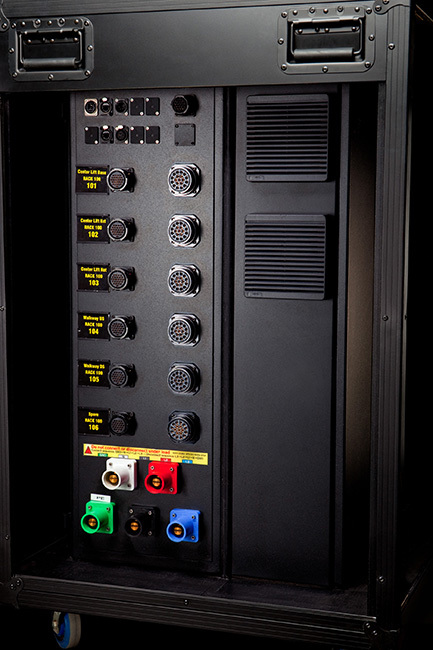 We also provide racks for power distribution to all of the motion and drive controls. As part of the safety and security system, we provide centralized or distributed Estop units to supervise all safety devices such as Estop buttons, safety light curtains, safety edges and more.